⭐ Recent restrictions on funding, planning approvals and foreign investment has completely reshaped the Australian real estate market. Is it the end of the show? Or does it represent new opportunities? ⭐ Major developers such as Mirvac, Lendlease and Grocon have become the first movers on the new build-to-rent concept, while ambitious developer Aqualand has been unstoppable, acquiring more than 30 development sites in the past three years! There are significant rewards in the property development industry. However, it is also complicated and, at times, risky. Both investors and developers are working with ever-changing policies and market conditions that can determine whether a project succeeds or fails in a very short time. To succeed in this game, you need to connect with the right people who have up to date advice. This is the purpose of the Property Developers Conference. Our aim is to present the greatest minds in the industry to exchange their knowledge and connect attendees with opportunities for the future. This evening’s knowledge and networking event will bring together leaders from the property development industry. These will include Mr Iwan Sunito (Crown Group), Joe Agius (Cox Architecture), and Mark Harrison (Wingate Group). 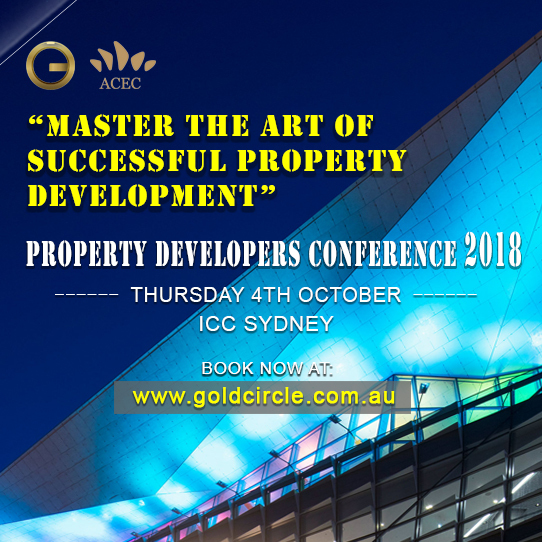 They will share their insights on the topic “Master the Art of Successful Property Development in Australia”. 1.You can network with ambitious investors, developers and other professionals for future opportunities. 2.Learn from award-winning developers, legal and financial advisors, fund managers and planners on the topics you need to know. 3.Break down the development process in Australia and learn what it takes to become successful. 4.Join our private Wechat groups and start posting property development related jobs, promote or explore off-market investment opportunities even before the conference starts. 5.Be part of the "Gold Circle" community, participate and join future events. Join us for an evening of inside knowledge and networking, secure your seat by buying a ticket today.